I told myself I am not going to get disturb by this incidence of plagiarism. 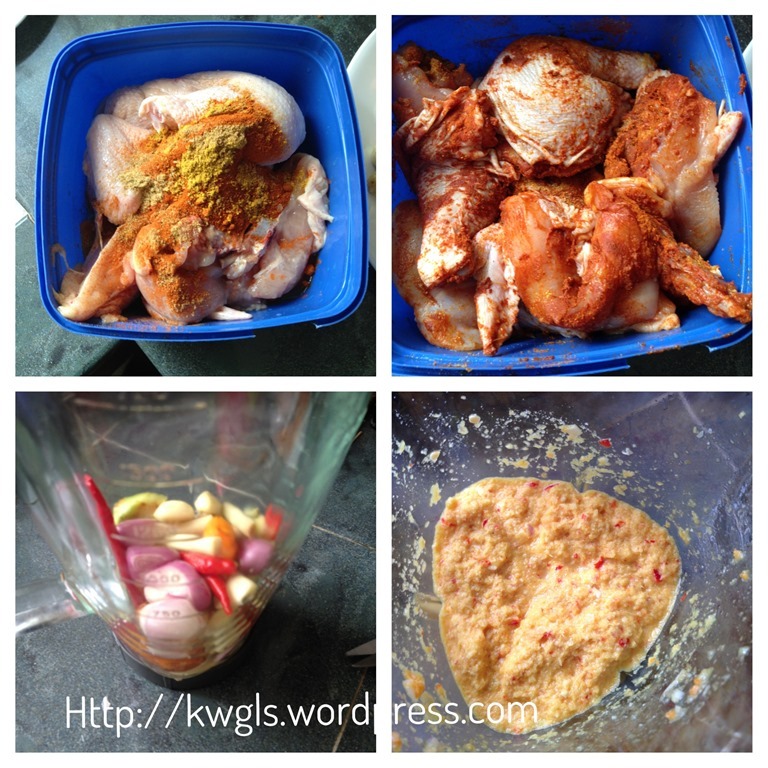 Somebody copy my recipe and picture and posted on his or her own blog. Besides my recipe, almost all the recipe from that particular blog were copied from elsewhere ..Despite our complaints to Blogger and Google, it seem nothing much have been done and if you are interested to look yes, do search for Ginne Pay from http://yummymakan.blogspot.sg/2014/06/mango-ice-cream.html. Any my original blog post is here: http://wp.me/p3u8jH-3up. This is not the only recipe copied, he/she copied my huat kuih recipe, coconut muffins,nian gao and too many recipe to check. 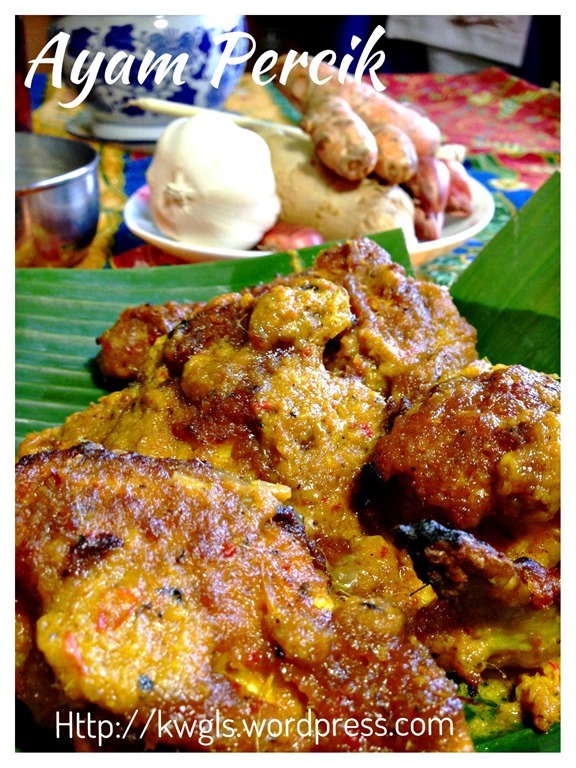 Putting this aside, what I am sharing with all today is ayam percik. 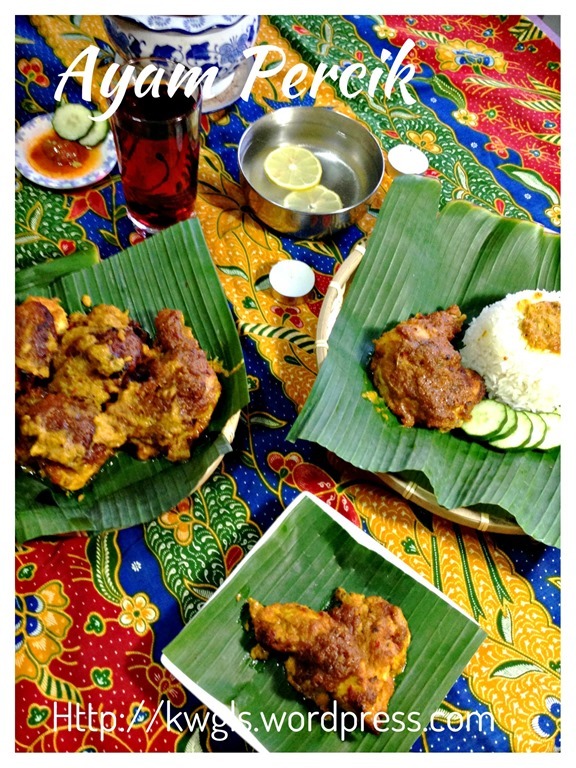 Ayam is literally translated as chicken and percik means splash in Malay Language. 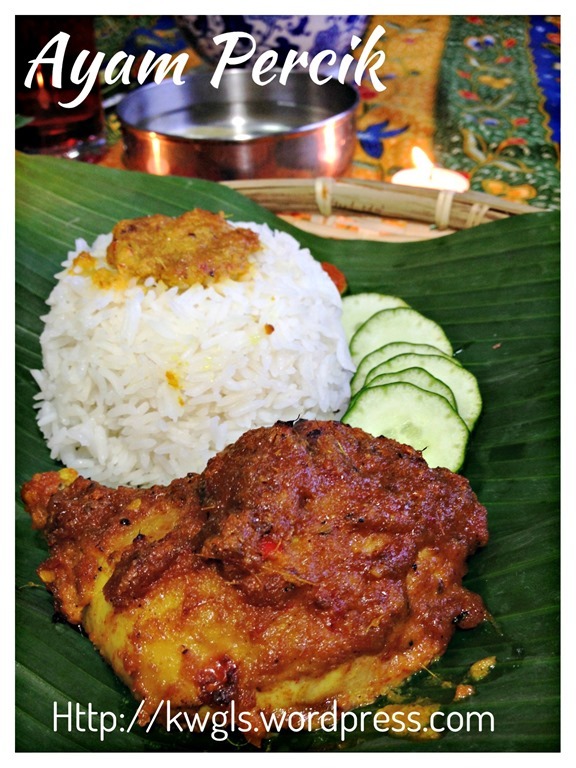 It is believed that the dish originated from the Northern States of Kelantan, Malaysia. 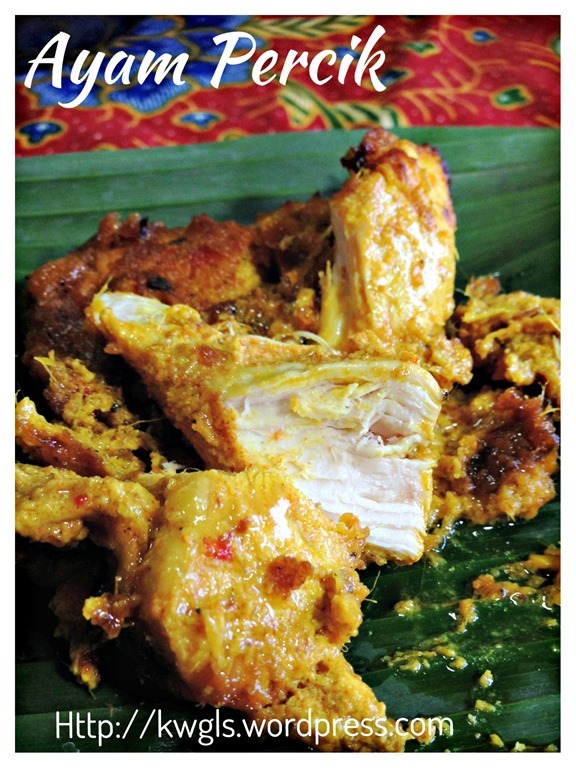 As per Wikipedia, this is also known as ayam golek in some states, it is grilled marinated chicken basted with a spiced coconut milk gravy. 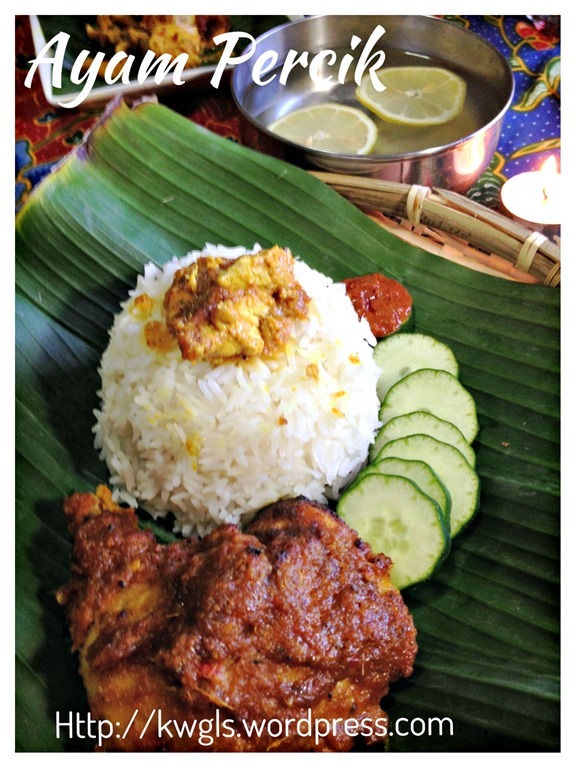 (Source: http://en.wikipedia.org/wiki/Malaysian_cuisine). 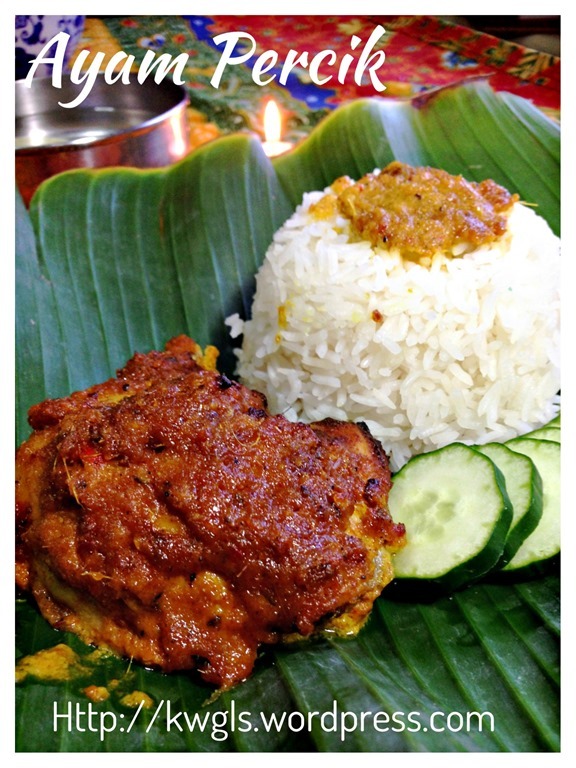 The dish is usually found in the restaurants, night markets and especially common during the holy fasting month of Ramadan in the Muslim operated stores. 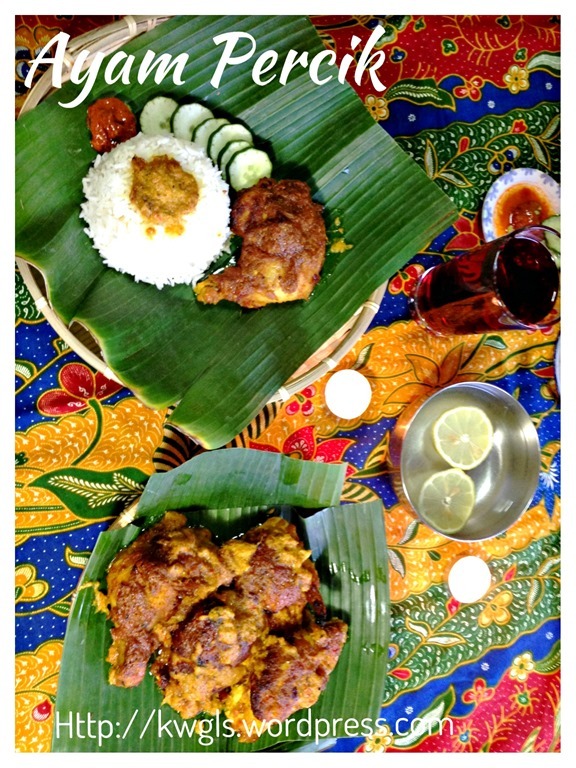 I have my fair share of ayam percik during my university days in Kuala Lumpur, Malaysia and have not been eating this for quite a while since I settled in Singapore. 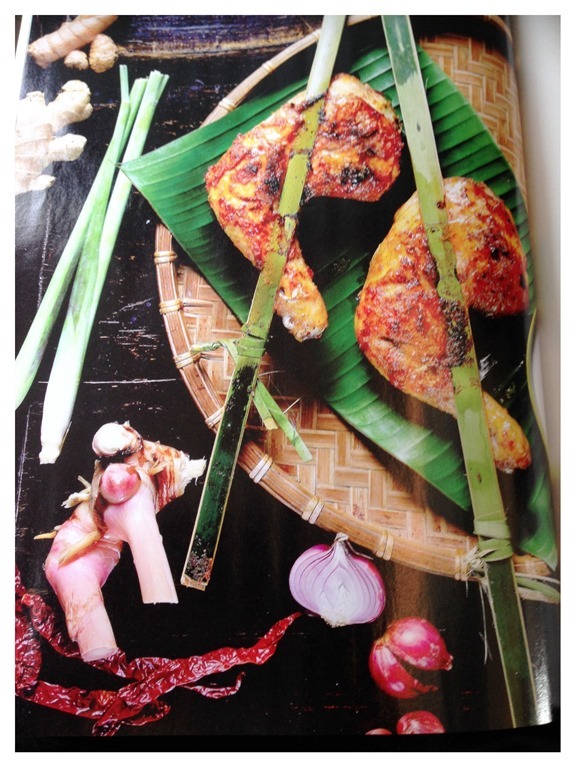 I stumbled across a recipe in the Malaysian Airlines inflight magazine about this special dish and I have decided to replicate the dish based on the pictures as shown in the magazine. I am pleased with the adventures and taste was very closed to what I have tasted before. This is the simplified procedure. 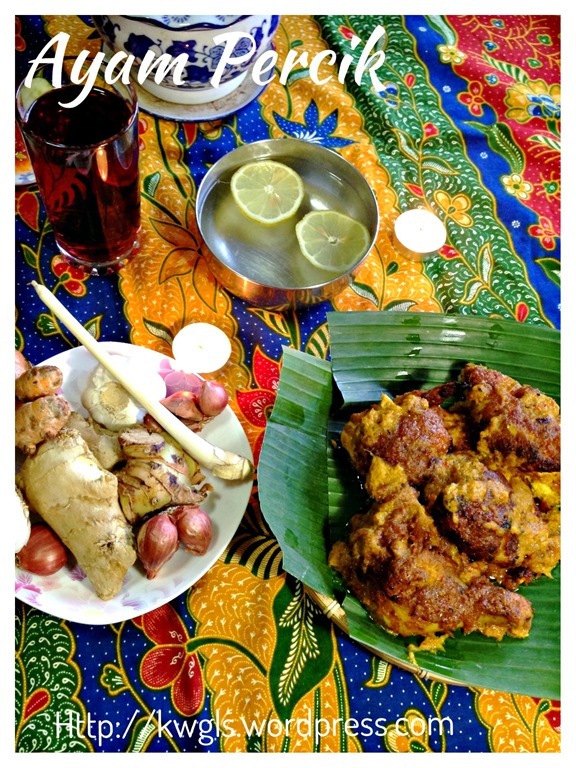 Traditional, the chicken was being marinated and grilled over charcoal stove until it is cooked. 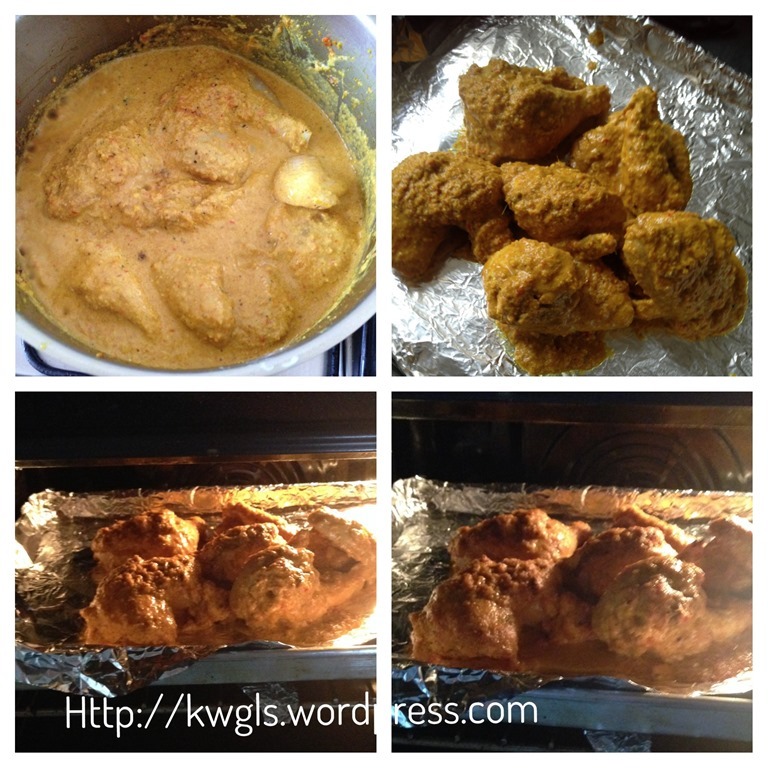 However, for this recipe, the chicken was half cooked and grilled in the oven. This had cut short the preparation time significantly. Pre-heat oven to 180 degree Celsius and get ready a baking tray lined with aluminium foil. 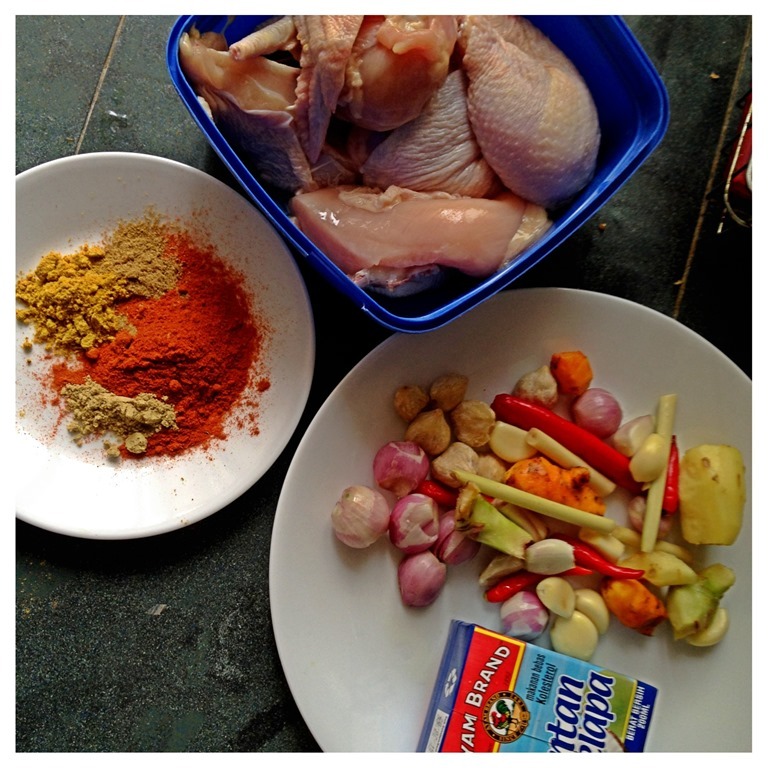 Cut and clean the chicken, drain, add the powder spice mix and marinate the chicken for about 1 hour in the fridge. In a blender, put all the spice mix ingredients for sautéing, some water (about 2/3 height of the ingredients) and blend the herbs and spices in coarse form. Please do not blend it too fine because the meat tastes better with the coarse herbs after grilling. Set aside for later use. In a hot pot, put the cooking oil and sauté the blended herbs until fragrant. In this process, you will witness the water getting less and less and the colour of the herb started to change. Add in the marinated chicken, stir fry for about 2-3 minutes until well mix. 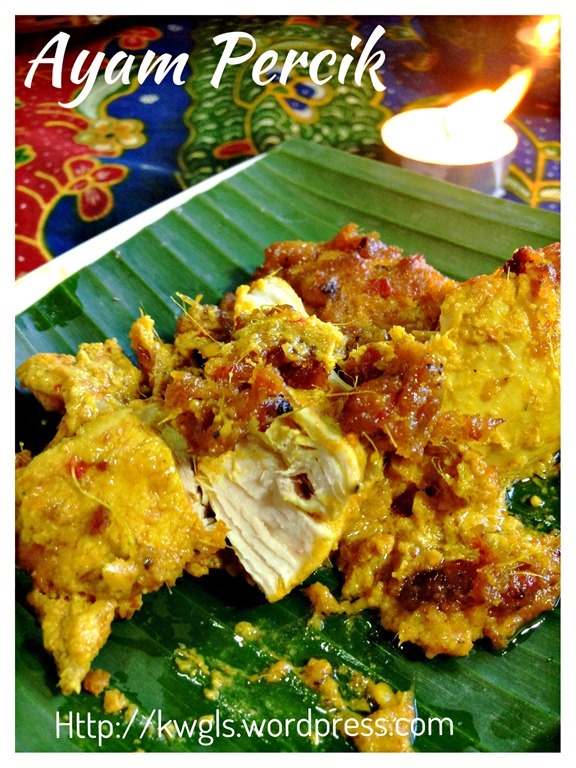 Add in the tamarind pulp, thicken coconut milk or a bit more water just enough to cover the chicken. Bring to boil and turn the heat to medium. 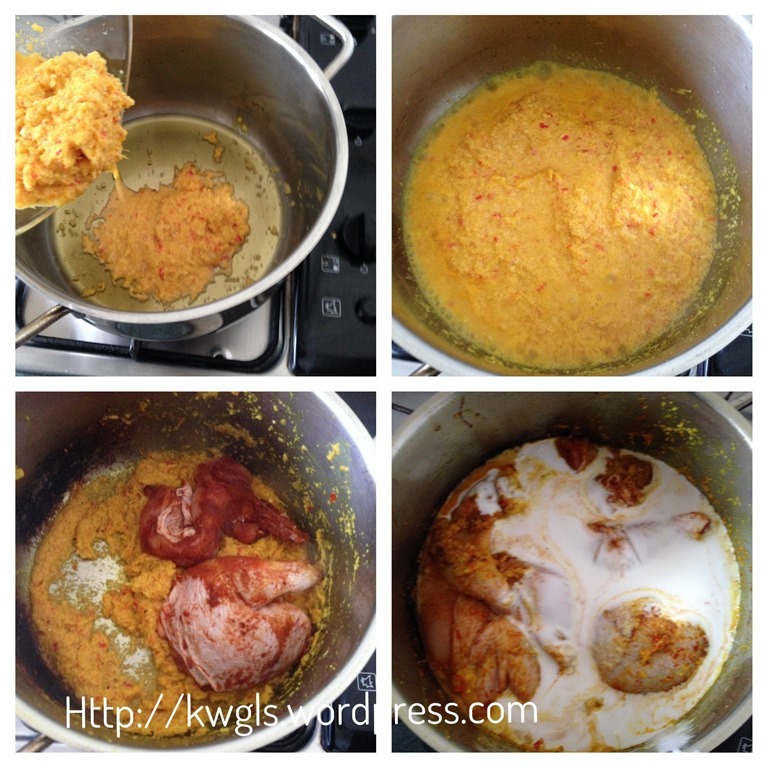 Let it simmer for about 10 –15 minutes. By then the chicken should be at least 50% cooked. Off the heat. Transfer the half cooked chicken to the baking tray lined with aluminium foil. Using the top grill mode, grill in the oven at 180 degree Celsius for about 15-20 minutes or until the top have signs of burnt. Timing is an estimation and you should keep a close eye on the chicken. By 15 minutes, your chicken to be cooked. Depending on your needs, you can always extend the cooking time and cooked until the desired texture you like. If you prefer more char flavour, you will have to grill it longer. 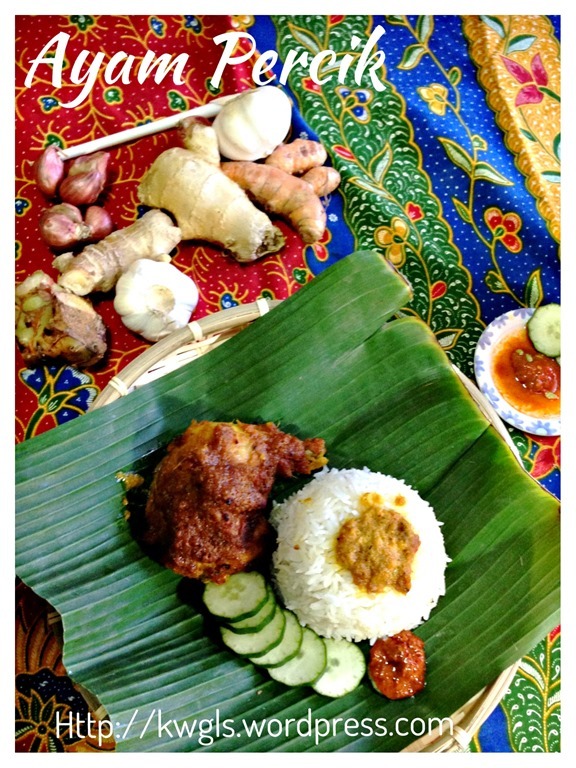 Best served with some hot rice as a side dish in a typical Malaysian meal. Is it not as difficult as what you thought? 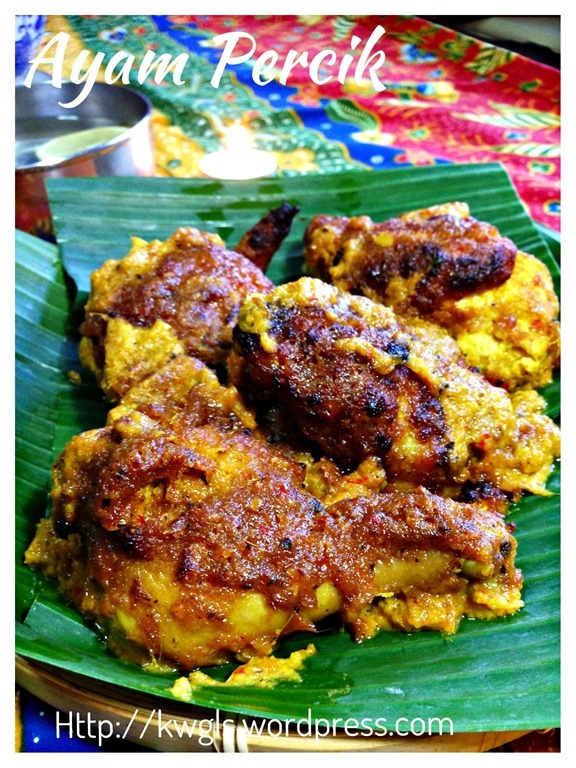 Do give it a try and if you like curry, I believed you will definitely not rejected this more flavourful juicy spiced chicken. 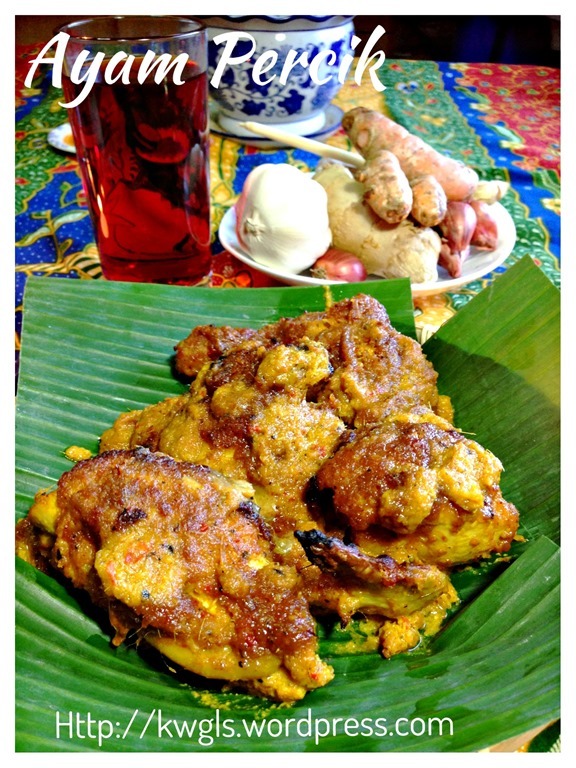 This entry was posted in Dish, Food Preparation Series, Meat Dishes and tagged 8, ayam golek, ayam percik, GUAI SHU SHU, Guaishushu, postaday, 椰汁香料烤鸡， kenneth goh. Bookmark the permalink. Kenneth, your a yam percik looks delicious. I am going to cook this soon. Thanks for sharing. Do try and hope you like it . When do u put in the tamarind pulp? Thanks for highlighting. Together with the coconut milk. 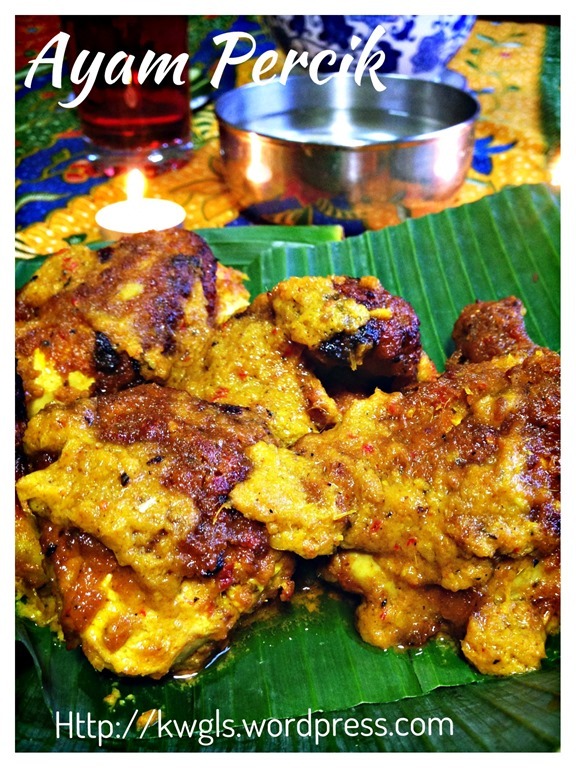 I tried this recipe and it turned out amazing , delicious, moist full of flavour, thank you!! so happy to hear that..
your recipe is the closest to my mom’s . The only difference is that she don’t marinade the chicken. I bbq instead of oven. Love the smell and make the neighbors drool !! Thank you for your many many recipes. If can not find candlenuts, can replace other ? Where is place can buy in singapore ?